Buena Vista Watersports ofrece clases de esquiar en agua y wakeboard, asi como manejar waverunners y paseos en tubos. Esta ubicado en Lake Bryan contiguo al Holiday Inn Sunspree en State Road 535, a solo 0.25 mile South of I-4 (Exit 68). The Kissimmee Dive Center offers local and regional dive trips and a full-service dive shop, as well as a full line of diving gear. 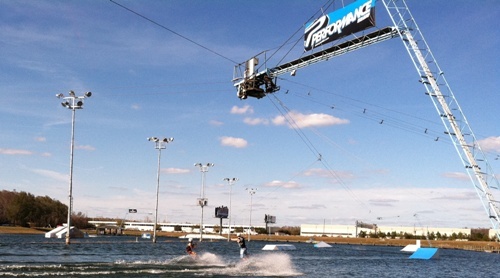 Enjoy wakeboarding and waterskiing at this state-of-the-art watersports complex, which also features a pro shop and snack bar. Ski lessons are available. Sammy Duvall Watersports Centre esta ubicado en el corazón de Walt Disney World Resort en Disney's Contemporary Resort. In addition to waterskiing, wakeboarding and tube riding, Water Sports of Kissimmee rents waverunners, pontoon boats, electric boats. Guided bass fishing tours are also available. PROMO - Tiquetes de Disney World desde $35 ---Animate!